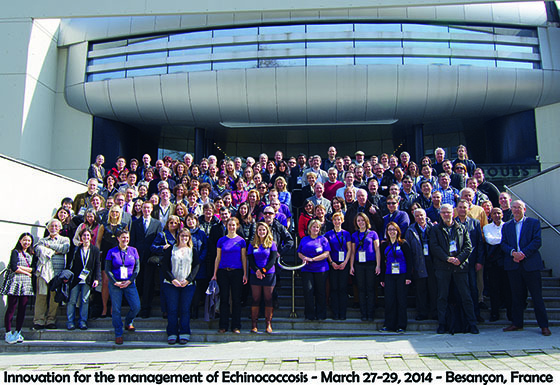 The symposium "Innovation for the management of echinococcosis" took place in Besançon from 27 to 29 March 2014, organized by the Chrono-Environment Laboratory of the University of Franche-Comté, the Institute of Parasitology, University of Bern, The WHO Collaborating Center for the Prevention and treatment of human echinococcosis, the National Reference Center "Alveolar echinococcosis" and the International Research Group "Ecosystem health and environmental disease ecology." It was attended by 155 of the world’s top specialists in the field, belonging to 29 nationalities. It had a large Chinese delegation of 12 people (21 papers), and German colleagues, English, Australian, Japanese, and French members of the GDRI Ecoystem Health and Environmental Disease Ecology (GDRI EHEDE). Alveolar echinococcosis is a disease that humans can contract by accidentally ingesting eggs of a parasite worm present in the faeces of a carnivores, often a fox or a dog infected following the consumption of a infected small mammal (vole, etc..). If human disease is rare, although expanding in Europe, half of the hundreds of European cases is identified in France and their number has doubled in ten years. Franche-Comté has 40% of the national cases, approximately 250 people, Alveolar echinococcosis is also of interest for provinces and regions of western China where the number of cases is not precisely known but exceeds ten thousands. The general program of the conference was primarily focused on the clinical aspects and treatment of patients. A session was reserved for the management of the disease in its epidemiological, animal and human aspects, and for studies on the ecology of the parasite. GDRI EHEDE members were able to contribute to the multidisciplinary nature of this event, share their recent work and initiate new collaborations. One example is the University of Calgary, Alberta (Canada), where several strains of alveolar echinococcosis, including the European strain have been discovered but where transmission ecology of the disease remains largely unexplored.